This is a re-released version of Item 58050, the classic Tamiya 2WD R/C buggy which was originally released in 1985. A roll cage and headlights help give this buggy a scale-realistic presence. The body and roof are made from durable, lightweight polycarbonate and a driver figure is included to liven up the cockpit. Ribbed front tires provide directional control and rear tires feature a block tread pattern for high grip, allowing you to enjoy dynamic off-road action. 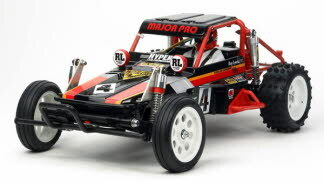 Durable light weight ABS frame is matched with a battery case which is compatible with modern power sources such as Tamiya Racing Packs and LF batteries. 4-wheel independent suspension is equipped with aluminum oil dampers and trailing arms and a wide tread ensures excellent off-road stability. Enclosed gearbox protects against dirt and debris and is equipped with a differential for smooth cornering. In addition, driveshafts feature dogbone-type joints and dust covers to ensure superb protection.